Growing up, Tony Donovan, 69, had the same hopes and dreams as any young man. But his addiction to alcohol took a heavy toll – even leaving him homeless at one point – and life didn’t work out the way he’d planned. It is only now as he is coming out of rehab and getting involved with The Right Key’s Recovery café that he feels he has a purpose again and is going to make the most of his life. “When I think back to when I was 18 or so, I had the same ambitions as anyone else – to have a good job in life, and to meet a nice girl, get married and settle down, and probably have a few children. But my addiction was to take me on a completely different journey than what I had wished for,” said Tony. For years, Tony, originally from Dublin and now living in Belfast, was able to hide his issues with drink. He worked successfully in a variety of jobs. On the surface, everything seemed fine. It was the beginning of a downward spiral for Tony that he has only recently been able to stop with support from the Right Key, a group based at their Recovery Café in Dromore, Co Down. The group has just received £159,409 from the Big Lottery Fund’s People and Communities programme to use music and crafts to support people in recovery from addiction. Tony is involved in the new project supported by Big Lottery Fund and worked with other volunteers to prepare for it. 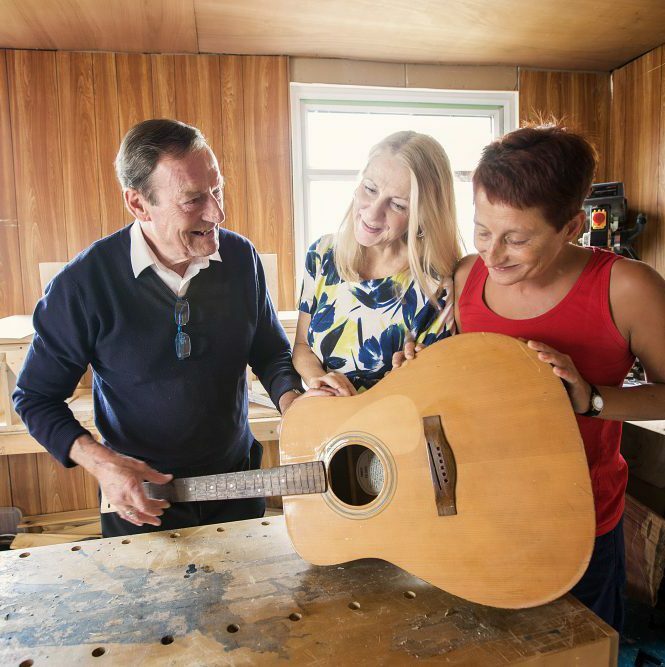 Through it people affected by addiction will learn new craft skills including guitar making, and come together with others for support and friendship. They’ll also put together a Book of Recovery telling people’s deeply personal stories. Sheila Smyth, development officer at the Right Key, said the new Big Lottery funded project a way of giving people meaning and hope for the future. “The people that we work with may be coping with addiction but they also have another side to them. Before their lives went into ashes, many of them would have had good hand skills like cabinet making and joinery, or had an artistic side. They hadn’t used those skills anymore because their addiction took them to such an awful place. We talked to them about what they wanted to do and they told us that wanted to be active, and make things with their hands to feel content and worthwhile again. Sheila said people are finding so much solace in the experiences of others. “While they are working on all this, there are conversations happening about addiction, recovery and sobriety that are amazing. That’s what it’s about,” she said. ← Awards for All grants of £65,039 to Derry/Londonderry groups.